Funeral services for H. Elaine Gillard, age 90, of Glenville, will be held at 10:00 a.m. on Saturday, March 30, 2019 at First Lutheran Church in Glenville. Vicar Josh Blair and Rev. Grant F.C. Gillard will officiate. Interment will be at Greenwood Cemetery. Visitation will be from 5:00-7:00 p.m. Friday, March 29 at Bayview/Freeborn Funeral Home and one hour prior to the service at the church on Saturday. Online condolences are welcome at www.bayviewfuneral.com. 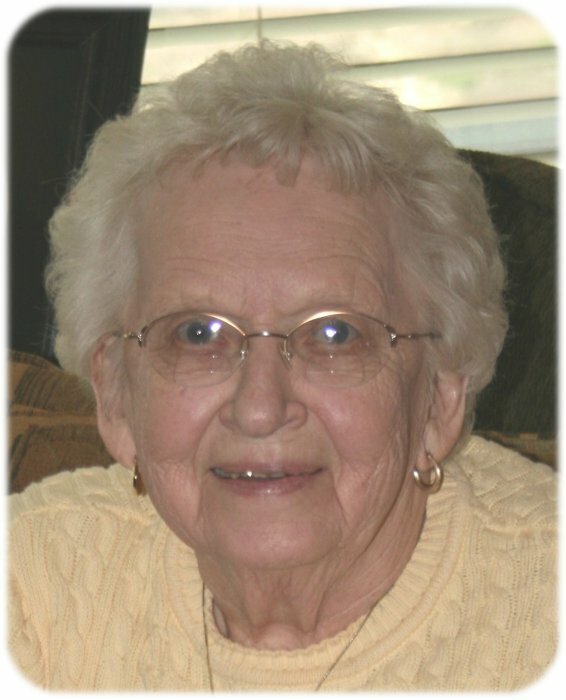 Elaine died Tuesday, March 26, 2019 at Lake Mills Care Center. H. Elaine Gillard was born on August 20, 1928 in Northwood, Iowa, the daughter of Harvey and Cora (Westrum) Lau. She graduated from Austin High School. On May 21, 1950, Elaine was united in marriage to Charles Gillard. She was a member of First Lutheran Church in Glenville where she was active in the Church Circle and Ladies Aid. She was also a member of the Legion Auxiliary and the Greenwood Club and was a 4-H Leader for many years. Elaine enjoyed sewing, church quilting, and baking for the county fair. She also liked gardening and hanging Christmas lights. She loved being with family, especially attending her grandchildren’s many special events. Elaine is survived by her daughters, Pam (Steve) Shirk of Bricelyn, Cindy (Greg) Recknor of Hartland; son, Tom (Doreen) Gillard of Austin; grandchildren, Andrea (Justin) Hockert, Alison Shirk, Amy (Adam) Ray, Katie (Nick) Wayne, Jess (Ashley) Recknor, Laura (Jason) Maschka, and Dustin (Anita Joseph) Gillard; great-grandchildren, Jackson Hockert, Reese Hockert, Savannah Ray, Cameron Ray, Amelia Wayne, Graham Wayne, Lincoln Wayne, Rylan Recknor; sisters, Arcley Wahlers and Esther (Luverne) Walheim; brothers, Arvid “Bud” Lau and Robert (Mary) Lau; sister-in-law, Marina Gillard. Elaine was preceded in death by her husband, Charles Gillard; daughter, Sue Gillard; parents, Harvey and Cora Lau; sister, Sharon Berg; sisters-in-law, Marge Lau, Barbara Gillard, and Calla Jean Bernloehr; brothers-in-law, Wayne Wahlers and Jack Gillard.